Orangetheory Fitness, a fitness franchise focused on trainer-led group workouts, was founded in 2010. 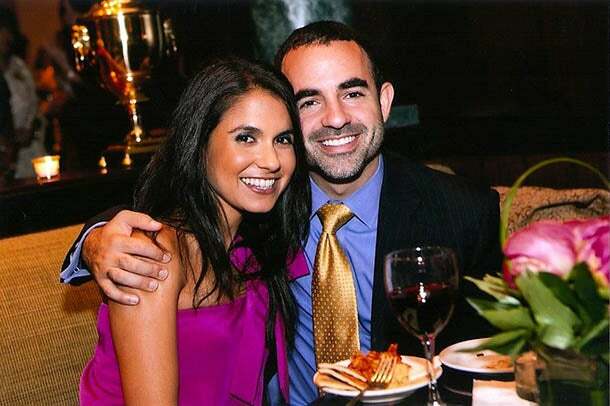 Five years later, Adam Krell and Jessica Kumari opened the franchise's first location in Manhattan, N.Y. Here's why this pair of newlyweds decided to open a fitness franchise in one of the most difficult cities in which to franchise in the world. Adam Krell and Jessica Kumari. Image credit: Adam Krell and Jessica Kumari. Franchise owned: Orangetheory Fitness in Edgewater and Garwood, N.J. and Chelsea neighborhood in Manhattan, in New York, N.Y.
We’ve been Orangetheory franchise owners for two years. We opened our first studio in Edgewater, N.J. in September of 2013 and most recently opened the brand’s first New York City studio in Chelsea in March. We’ve always had an entrepreneurial spirit and knew we wanted to be business owners. Buying into a franchise system made sense to us, as we were intrigued by the idea of adapting to a proven system of success. Adam ran his own hedge fund, where he was also involved, and is still currently involved, in various retail stores in Manhattan. Jessica has a media background and was previously a television reporter for CBS and NBC News. We felt a strong connection to Orangetheory Fitness for various reasons. The business minds behind the brand understand the importance of providing their franchisees with solid business model while giving consumers a quality product that’s both unique and effective. We really believe in the brand and are blown away its rapid growth and impact its made in the health and wellness industry. The average start up cost is around $500,000. We reached out to industry experts to gain some insight into current health and wellness related trends and how these trends would translate into building a successful client base in our markets. We also spoke with other Orangetheory franchisees to learn about their experience with the brand and how they’re studios have grown since opening. We’re very hand-on when it comes to operating our business, so gathering first-hand feedback from existing franchisees was important for us from an operational standpoint. As with any new business, you will always encounter unexpected challenges. It's how you deal with them that make you successful. For example, never underestimate the power of weather! We opened our second studio in Garwood, N.J. in February of 2014 – also the month that we had several blizzards. We even had to stop our training because all of the roads were shut down. Despite the setback, we were still able to open on time and the best thing about winter is that everyone is ready to get out and transform their bodies for the spring and summer seasons. Opening a franchise is a lot of work, and it doesn’t end once the business is up and running. Through our experience, we’ve learned that being involved and hands-on in all aspects of the business is crucial to its success. While you don’t have to play a major role in every moving part, being aware of what’s going on enables you to run a business in a smart and effective manner. If you want to be successful, you have to be involved and apply a work ethic to your business that motivates your team to want to succeed. The success of our Manhattan studio has inspired us to expand Orangetheory’s presence in Manhattan. We’re seeking out development opportunities and plan to paint the Tri-State area Orange!